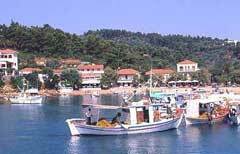 It is a small picturesque fishing village of the Aegean just across from Skiathos. A fabulous place for fishing, with blue green waters and small attractive beaches. You can have a unique experience riding a horse through the pine forest of Katigiorgis.